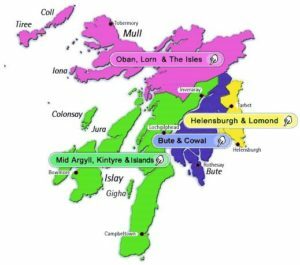 WASPI Argyll & Isles (Ann G) will be giving a talk to GREY MATTERS, focus group & forum for over 60s, in Helensburgh about how Argyll & Bute Westminster constituency (as in photo/map) group, developed & where the Campaign is today. Other group members, resident in the area, will be attending (this is not a public meeting). Waspi Argyll & Isles have had meetings/events in Helensburgh, Lochgilphead, Oban, Dunoon, Rothesay, Inverary & Campbeltown. As well as Bute, members have distributed flyers to Isles of Mull, Islay & Jura.